Baldwin County condo sales, including Gulf Coast condos, totaled 145 units in July. Sales were 26.1 percent higher than the same period a year ago. Year-to-date sales through July were 11.6 percent above 2014. 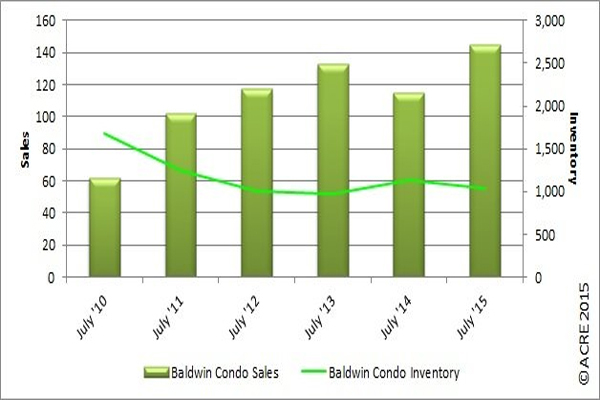 Baldwin County condo inventory totaled 1,039 units, a decrease of 7.7 percent or 86 units from July 2014. The inventory increased .1 percent from the previous month. This movement is consistent with historical data indicating that July inventory on average (from 2010 to 2014) decreases from the month of June by .7%. Condo inventory during the month of July hit its peak in 2006 at 3,380 units. The inventory is currently down 69.3 percent from that peak. In July, the number of months of condo supply was at 7.2, a decrease of 26.8 percent from 9.8 months last July and a big difference from July 2006 when the supply stood at 80.5 months. According to the Alabama Center for Real Estate (ACRE) Baldwin County condo sales in July were 21 units or 16.9 percent above the Center’s monthly forecast. ACRE’s year-to-date sales forecast through July projected 811 closed transactions while the actual sales were 964 units representing a favorable cumulative of 18.9 percent. Baldwin County condo sales were the same as the previous month. This direction is an improvement over seasonal buying patterns and historical data trends that reflect July condo sales on average (from 2010 to 2014) decrease from the month of June by 14.5 percent. The Baldwin County condo median sales price in July stood at $268,000, an increase of 21.8 percent from last July. The median sales price also improved 3.1 percent from the prior month. This, in contrast with historic data trends, (from 2010 to 2014) reflects the July median condo sales price on average decreasing from the month of June by 4.6 percent. The median condo sales price was 48.9 percent above the month of July bottom of $180,000 established in 2011 (one year after the now infamous oil spill). Be sure to follow Malcolm Bond on Twitter, and find us on Facebook as well.